In today's Atlanta Journal-Constitution, music critic Pierre Ruhe writes about left-handed musicians. Is there something special about how their brains interact with their craft? He focuses on pianists, who need to have an exceptional amount of left-right hand coordination. He and I talked about unusual features of the brains of lefties. Sandra and I have written on this before - check out our previous article. Praise for "Welcome to Your Brain"
Saturday, February 14, 2009. American Association of Science/SB&F acceptance of SB&F Book Of The Year award, Chicago, IL. Book signing. Sunday, January 25th. Good Morning America Weekend, ABC (national). Story on the lefthanded brain and President Obama. Sunday, November 16th, 6:30-8:30pm. Society for Neuroscience meeting, Washington DC. "How - and Why - To Communicate with Nonscientists About the Brain." At the Renaissance Hotel. Co-appearance with Dan Levitin, author of This Is Your Brain On Music. 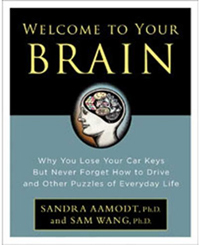 Week of July 21Here and Now (NPR) - Sam with WBUR's Robin Young, on the neuroscience of false beliefs. Monday, August 11th, 11:00am-noon, Radio Times - Sam with Marty Moss-Coane. April 9 - Podcast interview with Sandra for the New York Times. Anti-vaccine holdouts at Autism Speaks?